I'm full of disappointment. I feel like I've let my blog readers down this summer. I apologize. I had every good intention to make this, the 3rd season in the Summer Diary series, another fantastic one. But these last few weeks have been filled with nothing but boredom I'm afraid. Unfortunately not full of crafty awesomeness or much of anything creative. Again, I'm sorry. My diary of moving has been a tragic excuse for a summer diary. This packing & moving & unpacking stuff consumed me more than I realized it would. I even contemplated not posting during my move, since I was just not able to make the Summer Diary as awesome as it should have been. But I decided to keep it up, even with my uninteresting updates of boxes & boxes & more boxes, & mundane entries about being overwhelmed & tired. I was hoping, on this last day of summer break, to pause in the unpacking & do something totally fun with my girls. But that didn't happen. Instead, what DID happen was this: I've not been able to hear out of my left ear for over a week. I think this ear problem is messing up my equilibrium because today, while FINALLY getting a chance to attack the boxes in my art studio for the first time & set up my creative space, I began feeling rather dizzy & unbalanced, which led to me feeling nauseous, which meant I had to lay down & keep my noggin as still as possible, which meant I ended up taking a nap. The most memorable thing that happened today was when Zoey & I had to make a Walmart run to get more notebooks. (On our school supplies shopping trip earlier this week, we accidentally grabbed 'college ruled' instead of 'wide ruled'. *GASP! *) I really don't recommend going anywhere near the school supply aisles on the evening before school starts. Ever. We also snuck over to the pet area to see if the betta fish had arrived. Not yet. On the plus side: the Mr. contaced a fish shop. Hopefully, by this time tomorrow, new little fishy pets will be swimming in homes already waiting for them. 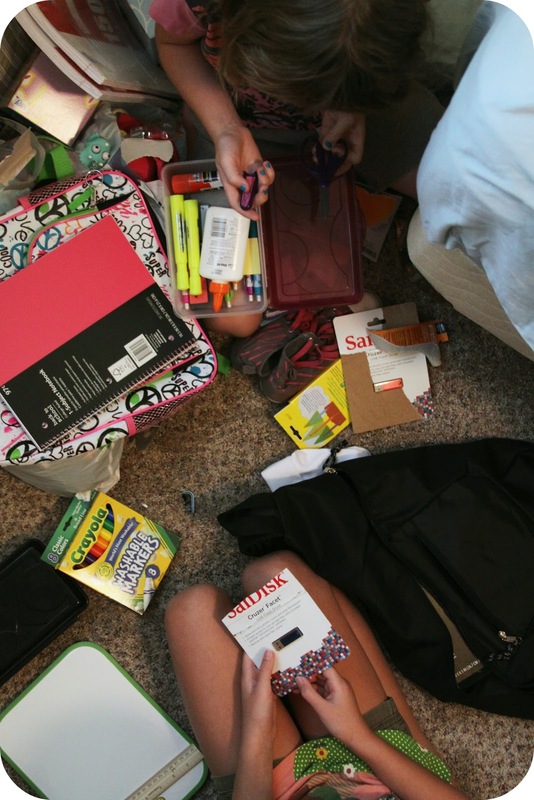 We prepped the backpacks, filling them with all the new shiny school supplies. We laid out the first-day-of-school outfits. (Which, sadly, don't include any new threads. I blame the unpacking.) I even prepped the kitchen for first-day-of-school pancake-making which will commence at 6:45 tomorrow morning. This evening the girls & I took a few moments, before their new early bedtime hit, to look back at the blog at all we did this summer. We all chose our favorite activites. Zoey loved shooting the guns. Pazely loved the night she & Zoey made mud pies outside on the sidewalk after a rain. I loved making the stop motion film with Susan, & getting to spend sunrise to supper time with her on that day. As the new schedule for school begins, I admit I'm not looking forward to rising early. But what I am looking forward to is new adventures in this new town we live in. I have a lot of freedom & a lot less responsibility since moving. I plan on totally jumping into as much of a creative experience as I can this next year. I am feeling this sense of freshness & newness & am going to run with it. As I get settled into this new routine of life in this new place, I'm planning on making time for scheming, concocting, contemplating, & designing. And you better believe I'll be sharing it all with you. First thing's first: finally setting up that creative space. Oh, & thank you for following along on our summer break. We appreciate each & every one of you! Technically, there's still one month + one week of summer left. So, enjoy the rest of yours!! I hope you're feeling better soon, hope it's nothing too serious. Good luck for the kids for the next school year :) They DO have a great Mum! I wish I lived close by because Matilda and I would love to go on adventures and coffee dates with you. I'm excited for your new season of freedom and less responsibility. I can hardly wait to see what flows forth from it. It's nearly fall & then the holidays!!!!!!!!!! Oh the fun to be had! Filling my new book bag with brand new school supplies, especially new notebooks was my fave. To this day I get a tingly tummy when I start a new notebook. Good luck girlies! You're gonna do great! No need to apologize - moving is a ton of work - very stressful and exhausting! Take care of yourself and your family and good luck settling into your new town!